Pre-season developments saw every NBA team preparing to beat and dethrone the Golden State Warriors as champs. And if the Steph Curry and Kevin Duran-led Bay Area franchise is fancied to again dominate for a rare three-peat, the many-time winner Boston Celtics are the second best choice. Everybody knows that. And that, Kyrie Irving knows, too. In an interview with ESPN.com where Irving touched on a variety of subjects -- his optimism for the next few years, his health and the rumors about transferring to New York along with Jimmy Butler. Why, he even talked about how the Celtics can break the Warriors’ monolith. The five-time NBA All-Star and former NBA champ said he's aware of the rumors about him and the disgruntled Minnesota Timberwolves stalwart of joining forces with the Knicks, but that he hasn't talked with Butler at length since they were playing for USA Basketball in 2016. “Why won't he commit to Boston?” People are asking. Well, Irving hasn't signed an extension, and could be in for a substantial payday in the summer of 2019 if all goes well. 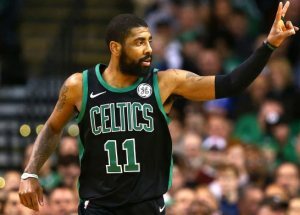 Irving says he's fine with the seemingly round-the-clock speculation about his future, saying, "I'm accepting it's going to be a constant story." There's more good stuff to unpack that should get Celtics fans excited about the 2018-19 season. For one, he believes he's been the healthiest and strongest he's been in three years, and says he has a confidence in his lower body now that was absent in the 2017-18 season, as knee issues flared up again in the spring that shut him down for the playoffs. Irving is confident that he will be hoisting the Larry O'Brien trophy comes the end of the coming season in June. "But there's one factor that they're aware of, and I'm aware of, and that's that I've seen them up close. I've played them so many times. We've gone in a seven-game series so I know what it takes," he noted. Over Games 3 through 7 in the 2016 Finals, Kyrie averaged 30.8 points and 4.4 assists while shooting just under 51 percent from the field. He averaged 29.4 points and 4.4 assists on 47 percent shooting in the 2017 Finals. Over the past couple of years, the Warriors' star players have consistently praised Kyrie and genuinely respect his game.